She's apparently a picky mater but not a picky eater. The female of a certain fly species, after mating with a male, dumps his ejaculate back out of her body and onto the ground. Then she gobbles it up. Despite new hints that this behavior may help the female choose which partner fertilizes her eggs, or keep her healthy in times of famine, scientists are still a little perplexed by it. Eating the ejaculate, as Euxesta bilimeki does, is less popular. This fly lives on agave plants and mates pretty much all the time. "Females can be observed escaping male advances in chases that can last more than an hour," write Christian Luis Rodriguez-Enriquez and his coauthors from the Instituto de Ecología in Veracruz, Mexico. 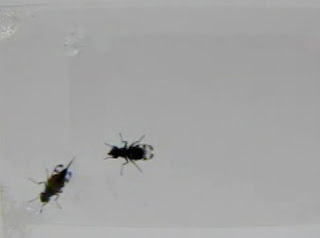 Using videocameras and careful meal planning, they tried to divine a reason for the female flies' behavior. Out of 74 females that the researchers recorded mating, every one expelled and ate the ejaculate afterward. The researchers then killed the females and pulled them apart with tweezers to look for sperm inside their various storage locations. They found that three-quarters of the females had kept some sperm from their male partner, while one-quarter had expelled it all. There was no obvious rule to which sperm the females kept. There were some patterns, though. For example, females that mated with larger males, then waited longer before expelling the sperm, were more likely to keep some. Since the female's behavior doesn't seem random—and since it's possible for her to keep no sperm at all—the authors think she may be choosing between mates after the fact. This could explain why the female expels the sperm, but not why she eats it. In another experiment, researchers fed female flies various diets and measured whether supplementing those diets with ejaculate made them healthier. When female flies were starved entirely, the extra snack did help them live longer—but under normal circumstances there was no difference. The authors report their results in Behavioral Ecology and Sociobiology. "Our study appears to have raised more questions than provided answers," the authors admit. They expected there would be some clear nutritional benefit to justify the females' tastes. Rodriguez-Enriquez and his coauthors speculate that the ejaculate-as-meal habit may have evolved as a "nuptial gift." This is an edible present that male insects sometimes give to females as part of their courtship. Usually it's nutritious—a nicely wrapped dead bug, say—but in some cases it's just an empty sac. The ejaculate may be, like these gifts, just an edible empty gesture. Image and video: Rodriguez-Enriquez et al. I think it is easy to explain why she eats it... sperm are tasty. More proof of Intelligent Design, obviously.